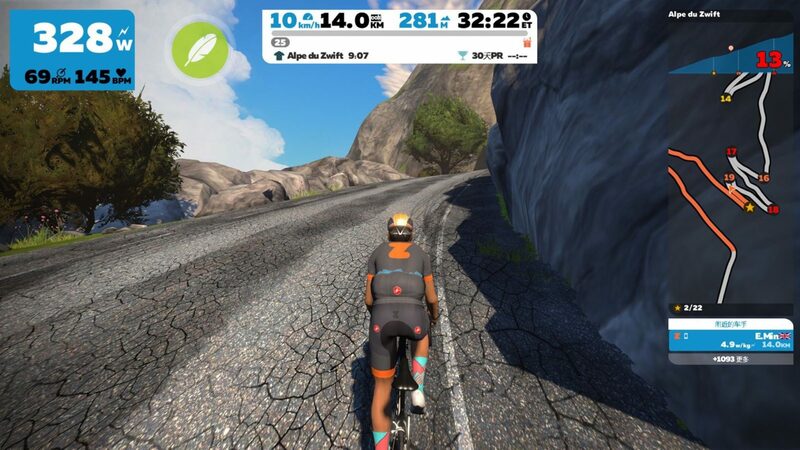 Zwift CEO Eric Min has traditionally posted a Strava “teaser” ride just prior to the launch of new routes, and this morning it happened again. This teaser, though, was Eric’s most challenging yet: a 56 minute climb up Alpe du Zwift! Alpe du Zwift (red) overlayed on the real-world Alp d’Huez (blue). The climb gains 1036 meters (3400′) over 12km (7.5 miles) with an average gradient of 9%. Surprisingly, the climb does not begin in the “construction zone” on the way to the Jungle Circuit. Instead, it begins with a right-turn near the flat section at the bottom of the forward Jungle Circuit. Min’s ride combined with a Jungle Circuit map to show location in Watopia. Min’s screenshot from the ride shows some major changes to the map layout at the top-right. 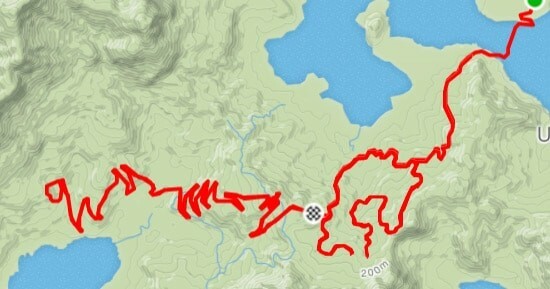 This map is much taller, and each bend in the climb is numbered, with some sort of segment tracking happening between bends so you receive a star for each bend completed. Additionally, you can see from Eric’s screenshot that Chinese language support has arrived. While Zwift never promises release dates, Eric’s Strava post means the release is just around the corner. We also know it must be released by April 9th, when an event is scheduled on the new roads. My guess is the release will happen Wednesday or Thursday night (March 28-29), but as always game master Jon Mayfield will make that call. It would be fun if they could change the thing so that instead of “Ride On” (in a vaguely southern US voice) that it instead say “Allez Allez!”. Yeah – but it’s so boring to cycle alone. Seriously boring……a real grinder. The real question is what trainer resistance will people be using up this thing? Why would it matter? It won’t affect their speed up the climb. Trainer difficulty just boosts gear ratio so you can spin more comfortable. In my opnion trying to climb HC climb undergeared is not something to be proud of, because it’s just stupid. Yeah , smart trainer recognition or you cant ride haha. Eh you can fake it with a smart trainer too just by lowering your weight or not tightening the wheel so much for a wheel-on. And the in-game resistance setting has nothing to do with speed. Just how much you have to shift. It also looks like the numbers on the hairpins have different colors – probable indicative of the grade. I’m…stoked…? for this update. As someone who loves to climb, I’m looking forward to the challenge. However I have to agree with other commenters in that they need to start giving us more. I mean, still no world choice? Seriously? There are tons of little things missing from the game that would make everyone’s experience better, and admittedly this update only serves a very small minority of the Zwift community. They admit the vast majority aren’t interested in climbs, so a massive one will interest even fewer people (though I’m in this minority, it still must be said). It’s time to focus on the overall user experience for sure. It’s true that it’s fun to have 20mph + rides….but massive climbs are cool too, especially if there are some perks along with it like the Tron bike. Heading out from the start line….getting some peace alone on a long epic climb might prove to be pretty fun. And….nothing really helps your fitness like climbing, right? Hehehe yep, totally agree. I’m like halfway to Tron… but riding season is just about here; I’ve done a couple outdoor rides already. So I doubt Tron will be mine this year. I’ll still Zwift, but not at a pace that will grant me the bike before fall I don’t think. If by world choice you mean changing worlds mid-ride, they’ve said it isn’t hard to do in game, but makes a mess in Strava. They could build a world select on login, but the config file hack is an easy workaround, so choose to spend energy on things that don’t have easy workarounds. I don’t need, and I don’t think anyone necessarily wants, to change worlds mid-ride. Saying the config file ‘hack’ is an easy workaround is excusing the Zwift team (now paid $15/mo per sub) from doing what they should have done at least a year ago, which is build a world select at login. Using a hack in a game does not excuse the poor UI that drove the need for that hack, I’m sorry. I’ve played video games for years, and if there’s a hack to say, turn all the other riders into zombies? Okay cool, that’s awesome and fun. Hacks to make the game do what it should be doing already are a pathetic excuse for saying it’s okay that the game deficiency exists. 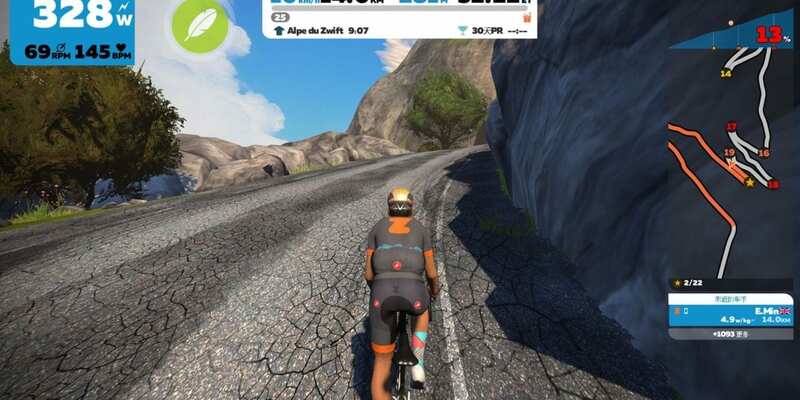 Plainly: if Zwift wants to be the World of Warcraft of cycling, they have a LOT of ground to cover, and they better start covering it, as people are already trying out other options. I didn’t mind paying for WoW, and I don’t mind paying for this, but I definitely need to see more improvements made for that money. Kudos Zwift! I am really looking forward to this. Looks like Chinese language support might finally be added as well. Hopefully, traditional characters are also supported. I believe the right turn will be at the Ziggurat. There is an unused junction and short road segment there in the current version. You can just barely see a dirt road off to the right when you first come to the flat section by the Ziggurat. I take it back – on closer inspection of Eric’s ride, they aren’t using the Ziggurat turn-off, so maybe that’s an indication of a future expansion, or maybe it’s just decoration. So not the full TdF climb then… looks like it stops at the entrance to town before going under the bridge… still, will be interesting to compare this with the Tacx RLV which I must have done hundreds of times. “It looks to be a twin of the climb to Viele Alpe (https://veloviewer.com/segments/652851 ) rather than to the TdF finish up through the town.” Looks good! I wonder if there’ll be any orange markings on the road at Turn 7 (aka Dutch Corner)? I truly hope there are orange markings. I’d love seeing a crowd and even orange smoke from flares. I understand it affecting riders in the TdF but in Zwift it would be a cool added effect. I hope so (said by a Dutchie ???????? Strangely enough Zwift does not seem to do the final couple of hundred meters of the climb: the sharp turn to the left and the final sprint. A good thing because this way the Zwift climb is shorter so we gain some seconds in comparison with the pro’s. 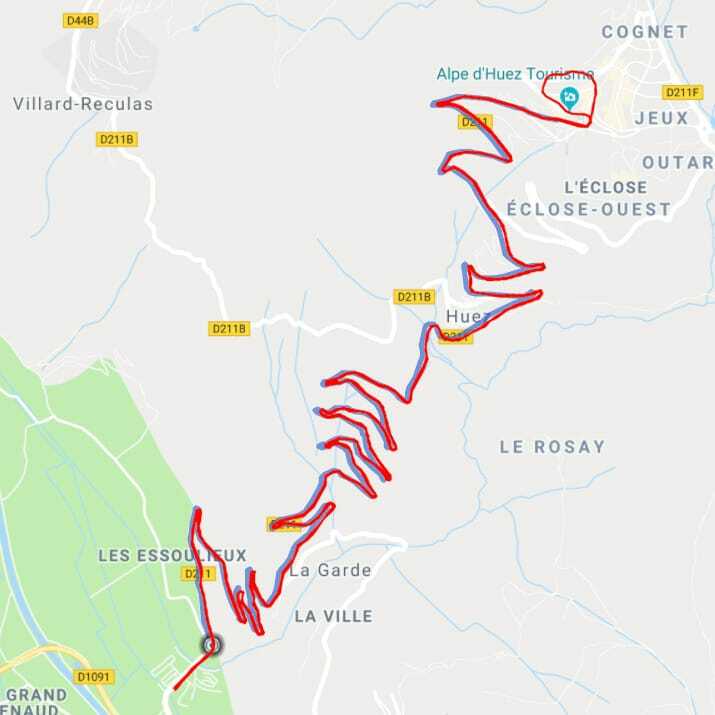 The numbers on the map refers to the famous 21 hairpins on Alpe D’Huez. Yes, but Zwift is planning to do some time tracking between each of those hairpins as well… so labeling them has importance for that reason too. It would be called “Simplified Chinese” – that’s the variant used in the PRC. “Traditional Chinese” is what is typically used outside of PRC (Hong Kong, Taiwan, etc). I noted that Eric Min had his screen set for Chinese, but I didn’t realize that this was something new. Yes – it’s live. You need to be level 12 to do Alpe de Zwift. Eric, I rode to the top of Alpe Du Zwift. It is amazing !!! I was one of the very first people to experience the climb. It was excellent !!! Side note: If you are at the top of the climb at night, you can see the Aurora Borealis (Northern Lights). There are more details to share, but I will spare you of all the details. This climb is truly amazing !!!!!! The people at Zwift did an excellent job !!! Must be level 12 to ride it. Wil the Zwift ride match Strava’s IRL segments?